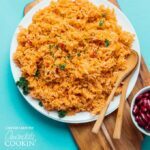 This Classic Spanish Rice recipe makes the perfect, flavorful side dish for busy weeknights (and it’s ready in less than 30 minutes with only a few minutes of hands-on work)! Heat oil in a large saute pan over medium/high. Add rice and toast until the grains begin to turn golden brown, stirring often, about 7 minutes. Reduce heat to medium and add onion and garlic, continuing to cook until onion is soft. Add broth, cover, and cook until rice is tender and broth is absorbed. About 15 minutes. Stir in salsa and serve warm. This recipe for Classic Spanish Rice was printed from AmandasCookin.com - https://amandascookin.com/classic-spanish-rice/ and can only be printed for education or personal use.